elliven studio: BRAVE Leather Giveaway! I can say that it's been such an honour working with team at BRAVE Leather the past couple of months! Incase you missed it, a little back story. This amazing company is not only based in Canada, but each piece is handcrafted (and has been from day one) in Canada, which is a pretty big deal! They hire local artisans and use only the finest Italian leather for every piece and even more amazing, every item is custom made-to-order! Other super fun facts about this wonderful company can be found here. If I had to pick just one piece as my favourite, which is tough, trust me, I'd have to go with the Giovana Tote. I love it for it's classic shape, generous size and the worn look of the leather! 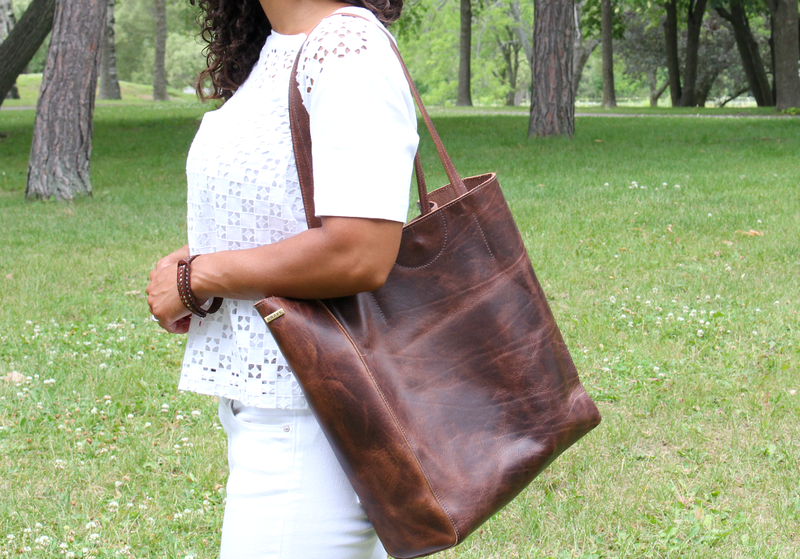 And for that reason, I'm excited to share that BRAVE Leather wants to give a Giovana Tote to one lucky winner! To enter, follow the instructions below. Contest is open to those living in Canada or the United States and closes Tuesday, September 15th at 12am EST. Good luck! This post is generously sponsored by BRAVE Leather, that however did not influence my opinion in any way. All opinions are my own. You have done a wonderful job styling the Brave Leather items and incorporating them into your summer wardrobe. The tote looks like a particularly useful piece! It's sturdy, stylish, and roomy. Beautiful! Love the bag and your outfit! I love Brave Leather bags - particularly the totes. Also love the leather bracelets! The Brave Tote would be the perfect, most-stylish piece to carry around 'mommy' things. Love it! Beautiful pieces all, but my favourite would be the Jabilo cuff. Julie, you showcase Brave Leather pieces so well! I'm a huge fan of this tote, it's gorgeous. Love their leather bracelets, too...so hard to choose! I love these leather pieces! My favorite is the Jabilo cuff or the tote. I have been admiring your tote for as long as you have been posting pics with it! As well as your cuffs. I do think I love the Giovana leather tote in T-Moro! I love the Saloso Leather Tote in Antique Gold!! I really like the nobel braided leather bracelet, and the Kaja cross body bag. I echo the comments above - you do wear the Brave leather pieces very well - it is a brand that very much suits you. I also really like the personalized pet collars they have! I might have to splurge on one of those for my boston terrier Cookie! The Giovana Tote is seriously my dream bag. Not even kidding. The Orini is gorgeous in every color, too. So glad to have learned about Brave Leather! I love the look of the Ryker leather crossbody bag! The NIKKI LEATHER SATCHEL BAG IN TAN CERVO is beautiful! Love the design.